Long-term potentiation (LTP) is a persistent increase in synaptic strength following high-frequency stimulation of a chemical synapse. Studies of LTP are often carried out in slices of the hippocampus, an important organ for learning and memory. In such studies, electrical recordings are made from cells and plotted in a graph such as this one. This graph compares the response to stimuli in synapses that have undergone LTP versus synapses that have not undergone LTP. 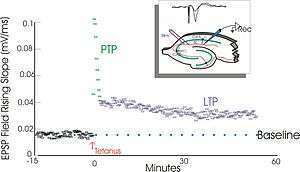 Synapses that have undergone LTP tend to have stronger electrical responses to stimuli than other synapses. The term long-term potentiation comes from the fact that this increase in synaptic strength, or potentiation, lasts a very long time compared to other processes that affect synaptic strength. It is one of several phenomena underlying synaptic plasticity, the ability of chemical synapses to change their strength. As memories are thought to be encoded by modification of synaptic strength, LTP is widely considered one of the major cellular mechanisms that underlies learning and memory. 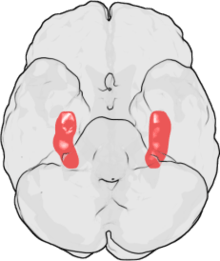 LTP was discovered in the rabbit hippocampus by Terje Lømo in 1966 and has remained a popular subject of research since. Many modern LTP studies seek to better understand its basic biology, while others aim to draw a causal link between LTP and behavioral learning. Still others try to develop methods, pharmacologic or otherwise, of enhancing LTP to improve learning and memory. LTP is also a subject of clinical research, for example, in the areas of Alzheimer's disease and addiction medicine. 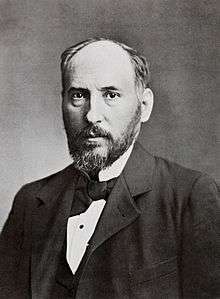 The 19th century neuroanatomist Santiago Ramón y Cajal proposed that memories might be stored across synapses, the junctions between neurons that allow for their communication. Though these theories of memory formation are now well established, they were farsighted for their time: late 19th and early 20th century neuroscientists and psychologists were not equipped with the neurophysiological techniques necessary for elucidating the biological underpinnings of learning in animals. These skills would not come until the later half of the 20th century, at about the same time as the discovery of long-term potentiation. Lømo's experiments focused on connections, or synapses, from the perforant pathway to the dentate gyrus. These experiments were carried out by stimulating presynaptic fibers of the perforant pathway and recording responses from a collection of postsynaptic cells of the dentate gyrus. As expected, a single pulse of electrical stimulation to fibers of the perforant pathway caused excitatory postsynaptic potentials (EPSPs) in cells of the dentate gyrus. What Lømo unexpectedly observed was that the postsynaptic cells' response to these single-pulse stimuli could be enhanced for a long period of time if he first delivered a high-frequency train of stimuli to the presynaptic fibers. When such a train of stimuli was applied, subsequent single-pulse stimuli elicited stronger, prolonged EPSPs in the postsynaptic cell population. This phenomenon, whereby a high-frequency stimulus could produce a long-lived enhancement in the postsynaptic cells' response to subsequent single-pulse stimuli, was initially called "long-lasting potentiation". A synapse is repeatedly stimulated. The physical and biological mechanism of LTP is still not understood, but some successful models have been developed. Studies of dendritic spines, protruding structures on dendrites that physically grow and retract over the course of minutes or hours, have suggested a relationship between the electrical resistance of the spine and the effective synapse strength, due to their relationship with intracellular calcium transients. Mathematical models such as BCM Theory, which depends also on intracellular calcium in relation to NMDA receptor voltage gates, have been developed since the 1980s and modify the traditional a priori Hebbian learning model with both biological and experimental justification. Still others have proposed re-arranging or synchronizing the relationship between receptor regulation, LTP, and synaptic strength. The pre- and postsynaptic activity required to induce LTP are other criteria by which LTP is classified. Broadly, this allows classification of LTP into Hebbian, non-Hebbian, and anti-Hebbian mechanisms. Borrowing its name from Hebb's postulate, summarized by the maxim that "cells that fire together wire together," Hebbian LTP requires simultaneous pre- and postsynaptic depolarization for its induction. Non-Hebbian LTP is a type of LTP that does not require such simultaneous depolarization of pre- and postsynaptic cells; an example of this occurs in the mossy fiber hippocampal pathway. A special case of non-Hebbian LTP, anti-Hebbian LTP explicitly requires simultaneous presynaptic depolarization and relative postsynaptic hyperpolarization for its induction. NMDA receptor-dependent LTP exhibits several properties, including input specificity, associativity, cooperativity, and persistence. 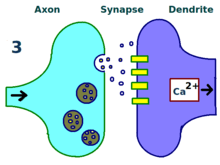 Once induced, LTP at one synapse does not spread to other synapses; rather LTP is input specific. Long-term potentiation is only propagated to those synapses according to the rules of associativity and cooperativity. However, the input specificity of LTP may be incomplete at short distances. One model to explain the input specificity of LTP was presented by Frey and Morris in 1997 and is called the synaptic tagging and capture hypothesis. LTP can be induced either by strong tetanic stimulation of a single pathway to a synapse, or cooperatively via the weaker stimulation of many. When one pathway into a synapse is stimulated weakly, it produces insufficient postsynaptic depolarization to induce LTP. In contrast, when weak stimuli are applied to many pathways that converge on a single patch of postsynaptic membrane, the individual postsynaptic depolarizations generated may collectively depolarize the postsynaptic cell enough to induce LTP cooperatively. 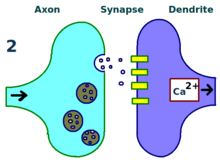 Synaptic tagging, discussed later, may be a common mechanism underlying associativity and cooperativity. Bruce McNaughton argues that any difference between associativity and cooperativity is strictly semantic. LTP is persistent, lasting from several minutes to many months, and it is this persistence that separates LTP from other forms of synaptic plasticity. While induction entails the transient activation of CaMKII and PKC, maintenance of E-LTP (early-form LTP) is characterized by their persistent activation. 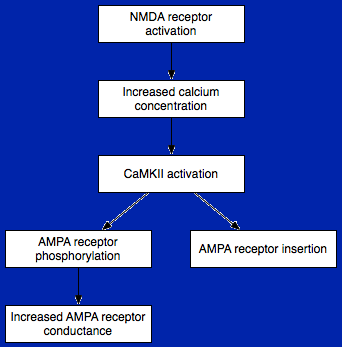 During this stage, PKMz (Protein kinase Mζ) which does not have dependence on calcium, become autonomously active. Consequently, they are able to carry out the phosphorylation events that underlie E-LTP expression. While the above model of E-LTP describes entirely postsynaptic mechanisms for induction, maintenance, and expression, an additional component of expression may occur presynaptically. One hypothesis of this presynaptic facilitation is that persistent CaMKII activity in the postsynaptic cell during E-LTP may lead to the synthesis of a "retrograde messenger", discussed later. According to this hypothesis, the newly synthesized messenger travels across the synaptic cleft from the postsynaptic to the presynaptic cell, leading to a chain of events that facilitate the presynaptic response to subsequent stimuli. Such events may include an increase in neurotransmitter vesicle number, probability of vesicle release, or both. In addition to the retrograde messenger underlying presynaptic expression in early LTP, the retrograde messenger may also play a role in the expression of late LTP. Late LTP (L-LTP) is the natural extension of E-LTP. Unlike E-LTP, which is independent of protein synthesis, L-LTP requires gene transcription and protein synthesis in the postsynaptic cell. Two phases of L-LTP exist: the first depends upon protein synthesis, while the second depends upon both gene transcription and protein synthesis. These phases are occasionally called LTP2 and LTP3, respectively, with E-LTP referred to as LTP1 under this nomenclature. Late LTP is induced by changes in gene expression and protein synthesis brought about by the persistent activation of protein kinases activated during E-LTP, such as MAPK. 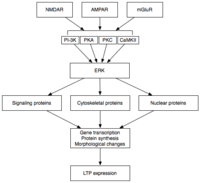 In fact, MAPK—specifically the extracellular signal-regulated kinase (ERK) subfamily of MAPKs—may be the molecular link between E-LTP and L-LTP, since many signaling cascades involved in E-LTP, including CaMKII and PKC, can converge on ERK. Recent research has shown that the induction of L-LTP can depend on coincident molecular events, namely PKA activation and calcium influx, that converge on CRTC1 (TORC1), a potent transcriptional coactivator for cAMP response element binding protein (CREB). This requirement for a molecular coincidence accounts perfectly for the associative nature of LTP, and, presumably, for that of learning. The identities of only a few proteins synthesized during L-LTP are known. Regardless of their identities, it is thought that they contribute to the increase in dendritic spine number, surface area, and postsynaptic sensitivity to neurotransmitter associated with L-LTP expression. The latter may be brought about in part by the enhanced synthesis of AMPA receptors during L-LTP. Late LTP is also associated with the presynaptic synthesis of synaptotagmin and an increase in synaptic vesicle number, suggesting that L-LTP induces protein synthesis not only in postsynaptic cells, but in presynaptic cells as well. As mentioned previously, for postsynaptic LTP induction to result in presynaptic protein synthesis, there must be communication from the postsynaptic to the presynaptic cell. This may occur via the synthesis of a retrograde messenger, discussed later. While the long-term potentiation of synapses in cell culture seems to provide an elegant substrate for learning and memory, the contribution of LTP to behavioral learning — that is, learning at the level of the whole organism — cannot simply be extrapolated from in vitro studies. For this reason, considerable effort has been dedicated to establishing whether LTP is a requirement for learning and memory in living animals. Because of this, LTP also plays a crucial role in fear processing. In 1986, Richard Morris provided some of the first evidence that LTP was indeed required for the formation of memories in vivo. He tested the spatial memory of rats by pharmacologically modifying their hippocampus, a brain structure whose role in spatial learning is well established. Rats were trained on the Morris water maze, a spatial memory task in which rats swim in a pool of murky water until they locate the platform hidden beneath its surface. During this exercise, normal rats are expected to associate the location of the hidden platform with salient cues placed at specific positions around the circumference of the maze. After training, one group of rats had their hippocampi bathed in the NMDA receptor blocker APV, while the other group served as the control. Both groups were then subjected to the water maze spatial memory task. 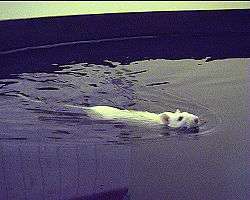 Rats in the control group were able to locate the platform and escape from the pool, while the performance of APV-treated rats was significantly impaired. Moreover, when slices of the hippocampus were taken from both groups, LTP was easily induced in controls, but could not be induced in the brains of APV-treated rats. This provided early evidence that the NMDA receptor — and by extension, LTP — was required for at least some types of learning and memory. Similarly, Susumu Tonegawa demonstrated in 1996 that the CA1 area of the hippocampus is crucial to the formation of spatial memories in living mice. So-called place cells located in this region become active only when the rat is in a particular location — called a place field — in the environment. Since these place fields are distributed throughout the environment, one interpretation is that groups of place cells form maps in the hippocampus. The accuracy of these maps determines how well a rat learns about its environment and thus how well it can navigate it. Tonegawa found that by impairing the NMDA receptor, specifically by genetically removing the NR1 subunit in the CA1 region, the place fields generated were substantially less specific than those of controls. That is, mice produced faulty spatial maps when their NMDA receptors were impaired. As expected, these mice performed very poorly on spatial tasks compared to controls, further supporting the role of LTP in spatial learning. The role of LTP in disease is less clear than its role in basic mechanisms of synaptic plasticity. However, alterations in LTP may contribute to a number of neurological diseases, including depression, Parkinson's disease, epilepsy, and neuropathic pain. Impaired LTP may also have a role in Alzheimer's disease and drug addiction. LTP has received much attention among those who study Alzheimer's disease (AD), a neurodegenerative disease that causes marked cognitive decline and dementia. Much of this deterioration occurs in association with degenerative changes in the hippocampus and other medial temporal lobe structures. Because of the hippocampus' well established role in LTP, some have suggested that the cognitive decline seen in individuals with AD may result from impaired LTP. In a 2003 review of the literature, Rowan et al. proposed one model for how LTP might be affected in AD. AD appears to result, at least in part, from misprocessing of amyloid precursor protein (APP). The result of this abnormal processing is the accumulation of fragments of this protein, called amyloid β (Aβ). Aβ exists in both soluble and fibrillar forms. Misprocessing of APP results in the accumulation of soluble Aβ that, according to Rowan's hypothesis, impairs hippocampal LTP and may lead to the cognitive decline seen early in AD. ↑ Paradiso, Michael A.; Bear, Mark F.; Connors, Barry W. (2007). Neuroscience: Exploring the Brain. Hagerstwon, MD: Lippincott Williams & Wilkins. p. 718. ISBN 0-7817-6003-8. 1 2 Cooke SF, Bliss TV (2006). "Plasticity in the human central nervous system". Brain. 129 (Pt 7): 1659–73. doi:10.1093/brain/awl082. PMID 16672292. 1 2 Bliss TV, Collingridge GL (January 1993). "A synaptic model of memory: long-term potentiation in the hippocampus". Nature. 361 (6407): 31–39. doi:10.1038/361031a0. PMID 8421494. ↑ Williams RW, Herrup K (1988). "The control of neuron number". Annu. Rev. Neurosci. 11 (1): 423–53. doi:10.1146/annurev.ne.11.030188.002231. PMID 3284447. 1 2 Ramón y Cajal, Santiago (1894). "The Croonian Lecture: La Fine Structure des Centres Nerveux". Proceedings of the Royal Society of London. 55 (331-335): 444–468. doi:10.1098/rspl.1894.0063. ↑ Hebb, D. O. (1949). Organization of Behavior: a Neuropsychological Theory. New York: John Wiley. ISBN 0-471-36727-3. 1 2 Terje Lømo (2003). "The discovery of long-term potentiation". Philos Trans R Soc Lond B Biol Sci. 358 (1432): 617–20. doi:10.1098/rstb.2002.1226. PMC 1693150 . PMID 12740104. ↑ Lømo, Terje (1966). "Frequency potentiation of excitatory synaptic activity in the dentate area of the hippocampal formation". Acta Physiologica Scandinavica. 68 (Suppl 277): 128. 1 2 Bliss T, Lømo T (1973). "Long-lasting potentiation of synaptic transmission in the dentate area of the anaesthetized rabbit following stimulation of the perforant path". J Physiol. 232 (2): 331–56. doi:10.1113/jphysiol.1973.sp010273. PMC 1350458 . PMID 4727084. 1 2 Bliss T, Gardner-Medwin A (1973). "Long-lasting potentiation of synaptic transmission in the dentate area of the unanaestetized rabbit following stimulation of the perforant path". J. Physiol. (Lond.). 232 (2): 357–74. PMC 1350459 . PMID 4727085. ↑ While the term "long term potentiation" appeared once in the original Bliss and Lømo paper, it was not formally proposed for the phenomenon until the Douglas and Goddard paper. ↑ Douglas R, Goddard G (1975). "Long-term potentiation of the perforant path-granule cell synapse in the rat hippocampus". Brain Res. 86 (2): 205–15. doi:10.1016/0006-8993(75)90697-6. PMID 163667. ↑ Andersen P (2003). "A prelude to long-term potentiation". Philos. Trans. R. Soc. Lond., B, Biol. Sci. 358 (1432): 613–5. doi:10.1098/rstb.2002.1232. PMC 1693144 . PMID 12740103. ↑ McEachern, JC; Shaw, CA (June 1996). "An alternative to the LTP orthodoxy: a plasticity-pathology continuum model". Brain Research Review. 22 (1): 51–92. doi:10.1016/0165-0173(96)00006-9. PMID 8871785. 8871785. ↑ Clugnet, MC; LeDoux JE (1 August 1990). "Synaptic plasticity in fear conditioning circuits: induction of LTP in the lateral nucleus of the amygdala by stimulation of the medial geniculate body." (PDF). J Neurosci. 10 (8): 2818–24. PMID 2388089. 1 2 3 4 5 6 7 8 9 Malenka R, Bear M (2004). "LTP and LTD: an embarrassment of riches". Neuron. 44 (1): 5–21. doi:10.1016/j.neuron.2004.09.012. PMID 15450156. ↑ Yasuda H, Barth A, Stellwagen D, Malenka R (2003). "A developmental switch in the signaling cascades for LTP induction". Nat Neurosci. 6 (1): 15–6. doi:10.1038/nn985. PMID 12469130. ↑ Harris E, Cotman C (1986). "Long-term potentiation of guinea pig mossy fiber responses is not blocked by N-methyl D-aspartate antagonists". Neurosci Lett. 70 (1): 132–7. doi:10.1016/0304-3940(86)90451-9. PMID 3022192. ↑ Wigström H, Gustafsson B (1986). "Postsynaptic control of hippocampal long-term potentiation". J. Physiol. (Paris). 81 (4): 228–36. PMID 2883309. ↑ Urban NN, Barrionuevo G (July 1996). "Induction of hebbian and non-hebbian mossy fiber long-term potentiation by distinct patterns of high-frequency stimulation". J. Neurosci. 16 (13): 4293–9. PMID 8753890. ↑ Kullmann DM, Lamsa K (March 2008). "Roles of distinct glutamate receptors in induction of anti-Hebbian long-term potentiation". J. Physiol. (Lond.). 586 (6): 1481–6. doi:10.1113/jphysiol.2007.148064. PMC 2375711 . PMID 18187472. ↑ McNaughton BL (April 2003). "Long-term potentiation, cooperativity and Hebb's cell assemblies: a personal history". Philosophical transactions of the Royal Society of London. Series B, Biological sciences. 358 (1432): 629–34. doi:10.1098/rstb.2002.1231. PMC 1693161 . PMID 12740107. ↑ Abraham WC (April 2003). "How long will long-term potentiation last?". Philosophical Transactions of the Royal Society of London. Series B, Biological Sciences. 358 (1432): 735–44. doi:10.1098/rstb.2002.1222. PMC 1693170 . PMID 12740120. 1 2 3 4 5 6 7 8 Lynch M (2004). "Long-term potentiation and memory". Physiol Rev. 84 (1): 87–136. doi:10.1152/physrev.00014.2003. PMID 14715912. 1 2 3 4 Sweatt J (1999). "Toward a molecular explanation for long-term potentiation". Learn Mem. 6 (5): 399–416. doi:10.1101/lm.6.5.399. PMID 10541462. ↑ Malinow R (2003). "AMPA receptor trafficking and long-term potentiation". Philos Trans R Soc Lond B Biol Sci. 358 (1432): 707–14. doi:10.1098/rstb.2002.1233. PMC 1693162 . PMID 12740116. 1 2 Emptage N, Reid C, Fine A, Bliss T (2003). "Optical quantal analysis reveals a presynaptic component of LTP at hippocampal Schaffer-associational synapses". Neuron. 38 (5): 797–804. doi:10.1016/S0896-6273(03)00325-8. PMID 12797963. ↑ Frey U, Frey S, Schollmeier F, Krug M (1 January 1996). "Influence of actinomycin D, a RNA synthesis inhibitor, on long-term potentiation in rat hippocampal neurons in vivo and in vitro". J Physiol. 490. (Pt 3) (Pt 3): 703–11. PMC 1158708 . PMID 8683469. ↑ Frey U, Krug M, Reymann K, Matthies H (1988). "Anisomycin, an inhibitor of protein synthesis, blocks late phases of LTP phenomena in the hippocampal CA1 region in vitro". Brain Res. 452 (1-2): 57–65. doi:10.1016/0006-8993(88)90008-X. PMID 3401749. 1 2 3 4 5 6 Kelleher R, Govindarajan A, Tonegawa S (2004). "Translational regulatory mechanisms in persistent forms of synaptic plasticity". Neuron. 44 (1): 59–73. doi:10.1016/j.neuron.2004.09.013. PMID 15450160. ↑ Kovács KA, Steullet P, Steinmann M, Do KQ, Magistretti PJ, Halfon O, Cardinaux JR (2007). "TORC1 is a calcium- and cAMP-sensitive coincidence detector involved in hippocampal long-term synaptic plasticity.". PNAS. 104 (11): 4700–5. doi:10.1073/pnas.0607524104. PMC 1838663 . PMID 17360587. 1 2 3 4 5 Serrano P, Yao Y, Sacktor T (2005). "Persistent phosphorylation by protein kinase Mzeta maintains late-phase long-term potentiation". J Neurosci. 25 (8): 1979–84. doi:10.1523/JNEUROSCI.5132-04.2005. PMID 15728837. 1 2 3 Pastalkova E, Serrano P, Pinkhasova D, Wallace E, Fenton A, Sacktor T (2006). "Storage of spatial information by the maintenance mechanism of LTP". Science. 313 (5790): 1141–4. doi:10.1126/science.1128657. PMID 16931766. ↑ Volk, Lenora J.; Bachman, Julia L.; Johnson, Richard; Yu, Yilin; Huganir, Richard L. (2 January 2013). "PKM-ζ is not required for hippocampal synaptic plasticity, learning and memory". Nature. 493 (7432): 420–423. doi:10.1038/nature11802. PMC 3830948 . PMID 23283174. 1 2 Meyer, D.; Bonhoeffer T.; Scheuss V. (2014). "Balance and Stability of Synaptic Structures during Synaptic Plasticity". Neuron. 82 (2): 430–443. doi:10.1016/j.neuron.2014.02.031. PMID 24742464. ↑ Kang H, Schuman E (1996). "A requirement for local protein synthesis in neurotrophin-induced hippocampal synaptic plasticity". Science. 273 (5280): 1402–6. doi:10.1126/science.273.5280.1402. PMID 8703078. ↑ Steward O, Worley P (2001). "A cellular mechanism for targeting newly synthesized mRNAs to synaptic sites on dendrites". Proc Natl Acad Sci USA. 98 (13): 7062–8. doi:10.1073/pnas.131146398. PMC 34623 . PMID 11416188. ↑ Pavlidis P, Montgomery J, Madison D (2000). "Presynaptic protein kinase activity supports long-term potentiation at synapses between individual hippocampal neurons". J Neurosci. 20 (12): 4497–505. PMID 10844019. ↑ Zakharenko S, Patterson S, Dragatsis I, Zeitlin S, Siegelbaum S, Kandel E, Morozov A (2003). "Presynaptic BDNF required for a presynaptic but not postsynaptic component of LTP at hippocampal CA1-CA3 synapses". Neuron. 39 (6): 975–90. doi:10.1016/S0896-6273(03)00543-9. PMID 12971897. ↑ Frey U, Morris R (1997). "Synaptic tagging and long-term potentiation". Nature. 385 (6616): 533–6. doi:10.1038/385533a0. PMID 9020359. ↑ Martin K, Casadio A, Zhu H, Yaping E, Rose J, Chen M, Bailey C, Kandel E (1997). "Synapse-specific, long-term facilitation of aplysia sensory to motor synapses: a function for local protein synthesis in memory storage". Cell. 91 (7): 927–38. doi:10.1016/S0092-8674(00)80484-5. PMID 9428516. ↑ Casadio A, Martin K, Giustetto M, Zhu H, Chen M, Bartsch D, Bailey C, Kandel E (1999). "A transient, neuron-wide form of CREB-mediated long-term facilitation can be stabilized at specific synapses by local protein synthesis". Cell. 99 (2): 221–37. doi:10.1016/S0092-8674(00)81653-0. PMID 10535740. ↑ Segal M, Murphy D (1999). "CREB activation mediates plasticity in cultured hippocampal neurons". Neural Plast. 6 (3): 1–7. doi:10.1155/NP.1998.1. PMC 2565317 . PMID 9920677. ↑ Straube T, Frey J (2003). "Involvement of beta-adrenergic receptors in protein synthesis-dependent late long-term potentiation (LTP) in the dentate gyrus of freely moving rats: the critical role of the LTP induction strength". Neuroscience. 119 (2): 473–9. doi:10.1016/S0306-4522(03)00151-9. PMID 12770561. ↑ Lu Y, Kandel E, Hawkins R (1999). "Nitric oxide signaling contributes to late-phase LTP and CREB phosphorylation in the hippocampus". J Neurosci. 19 (23): 10250–61. PMID 10575022. ↑ Frey U, Matthies H, Reymann K, Matthies H (1991). "The effect of dopaminergic D1 receptor blockade during tetanization on the expression of long-term potentiation in the rat CA1 region in vitro". Neurosci Lett. 129 (1): 111–4. doi:10.1016/0304-3940(91)90732-9. PMID 1833673. ↑ Otmakhova N, Lisman J (1996). "D1/D5 dopamine receptor activation increases the magnitude of early long-term potentiation at CA1 hippocampal synapses". J Neurosci. 16 (23): 7478–86. PMID 8922403. ↑ Morris R, Anderson E, Lynch G, Baudry M (1986). "Selective impairment of learning and blockade of long-term potentiation by an N-methyl-D-aspartate receptor antagonist, AP5". Nature. 319 (6056): 774–6. doi:10.1038/319774a0. PMID 2869411. ↑ McHugh T, Blum K, Tsien J, Tonegawa S, Wilson M (1996). "Impaired hippocampal representation of space in CA1-specific NMDAR1 knockout mice". Cell. 87 (7): 1339–49. doi:10.1016/S0092-8674(00)81828-0. PMID 8980239. ↑ Whitlock J, Heynen A, Shuler M, Bear M (2006). "Learning induces long-term potentiation in the hippocampus". Science. 313 (5790): 1093–7. doi:10.1126/science.1128134. PMID 16931756. ↑ Bliss T, Collingridge G, Laroche S (2006). "Neuroscience. ZAP and ZIP, a story to forget". Science. 313 (5790): 1058–9. doi:10.1126/science.1132538. PMID 16931746. ↑ Cooke SF, Bliss TV (July 2006). "Plasticity in the human central nervous system". Brain. 129 (Pt 7): 1659–73. doi:10.1093/brain/awl082. PMID 16672292. 1 2 Rowan MJ, Klyubin I, Cullen WK, Anwyl R (April 2003). "Synaptic plasticity in animal models of early Alzheimer's disease". Philosophical transactions of the Royal Society of London. Series B, Biological sciences. 358 (1432): 821–8. doi:10.1098/rstb.2002.1240. PMC 1693153 . PMID 12740129. ↑ Crary JF, Shao CY, Mirra SS, Hernandez AI, Sacktor TC (April 2006). "Atypical protein kinase C in neurodegenerative disease I: PKMzeta aggregates with limbic neurofibrillary tangles and AMPA receptors in Alzheimer disease". Journal of neuropathology and experimental neurology. 65 (4): 319–26. doi:10.1097/01.jnen.0000218442.07664.04. PMID 16691113. 1 2 Kauer JA, Malenka RC (November 2007). "Synaptic plasticity and addiction". Nature reviews. Neuroscience. 8 (11): 844–58. doi:10.1038/nrn2234. PMID 17948030. ↑ Wolf ME (August 2003). "LTP may trigger addiction". Molecular interventions. 3 (5): 248–52. doi:10.1124/mi.3.5.248. PMID 14993438.